Only one mile away from Green Exchange lies the Logan Square Farmers Market – considered by many to be the best in the city (with high marks from TimeOut Chicago, Chicago Reader, and more). It is around this time of year that farmers markets get into full swing as seasonal produce become ready to pick in July (think artichokes, bell peppers, corn). The Logan Square Farmers Market also offers food & retail vendors, making it a great place to snack & shop. Stop by the Logan Square Farmers Market on the picturesque historic boulevard at 3107 W. Logan Blvd., Sundays from 10am-3pm. For more information check out their website at logansquarefarmersmarket.org or on Facebook. Green-eating Chicagoans, rejoice! There are Farmers Markets open every day of the week – scattered in neighborhoods throughout the city. Check out the largest farmers market in the city – the Green City Market in Lincoln Park on both Wednesdays & Saturdays from 7am-1pm. For those who work in the Loop, the Daley Plaza Farmers Market is a convenient choice running every Thursday from 7am-3pm. 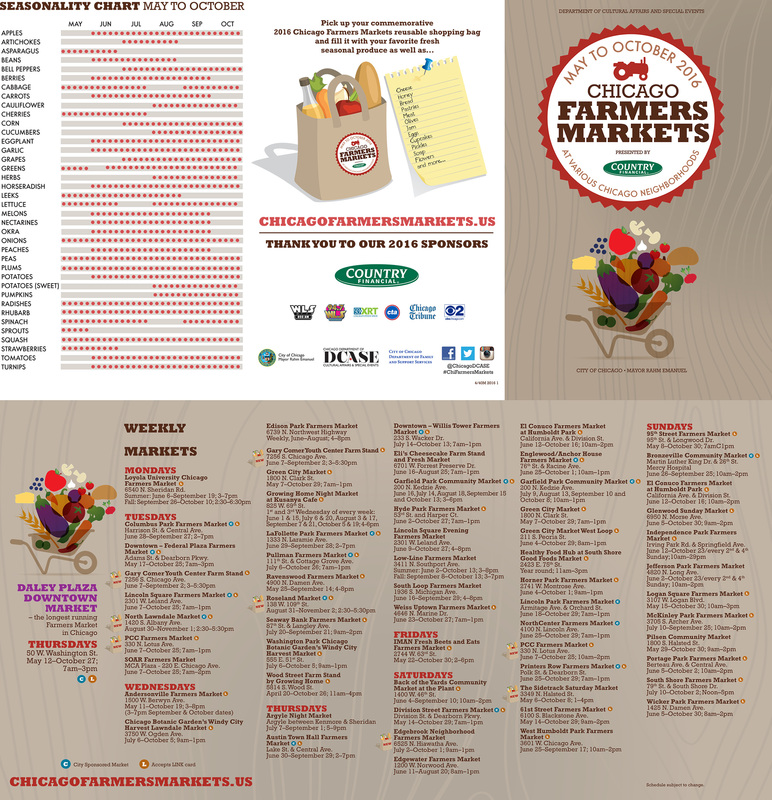 To see the full list of Chicago Farmers Markets & their schedules, locations, and hours, visit the Official City of Chicago Farmers Markets Site, or view the printable brochure here.